This time of year is the best. The crisp air, the falling leaves, and pumpkin pie. 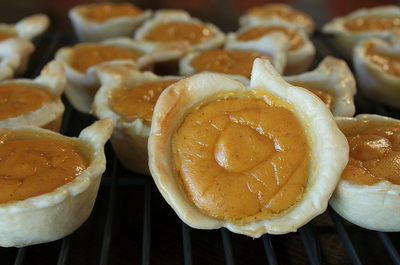 Try these individual pumpkin pies this year, instead of making a whole pie. They'll be a huge hit! Use cookie cutter to cut 12 circle shapes from each pie crust (about 3.5 inches wide). You will need to roll the dough thinner than it comes out of the box. Remove pies to cool and repeat with second pie crust. Place the muffin tray in the freezer to cool it quickly for re-use. When serving, add a dollop of whipped cream to the top if you'd like! We always host all of my husband's family over for dessert on Thanksgiving Day. This is perfect since it's already portioned out! Thanks for the great recipe! !